Paperback, 7.75 x 9.5 in. / 304 pgs / 60 color. Edited by Agnes Husslein-Arco, Bettina Steinbrügge. 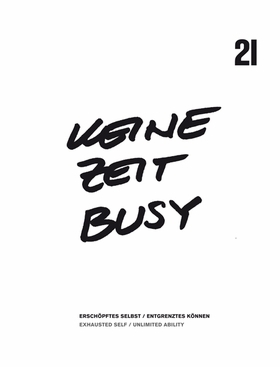 Text by Véronique Aichner, Diedrich Diederichsen, Alain Ehrenberg, Mario Fusco, Liam Gillick, Michel Houellebecq, Maurizio Lazzarato, Sven Lütticken, Angela Melitopoulos, Bettina Steinbrügge. This publication documents a group show that explores the relationship between productivity and creativity. Various artists--including Claire Fontaine, Thomas Baumann, Siggi Hofer, Santiago Sierra, Josephine Pryde, Christoph Meier and Adrian Williams--comment on the conflation of time and money. FORMAT: Pbk, 7.75 x 9.5 in. / 304 pgs / 60 color.